June 9: Construction Update: As one of the first steps in the construction of the new Life Sports Center, the Student Development Center, which included health services and counseling services, was demolished last week. Click here for photos. June 10: Parke Named to Academic All-America Team: Cameron Parke, who recently completed his career with the Muhlenberg mens tennis team, has been voted to the 2003 Verizon College Division Mens At-Large Academic All-America Team. He was a second-team selection. Parke, who graduated as a double major in business administration and political science, led Muhlenberg in wins with a combined record of 19-3 during the spring dual-match season. He finished his career as one of the Mules' all-time winningest players, with a record of 88-57-2. Parke is the first Academic All-American in the history of the Muhlenberg mens tennis program. He is the Colleges second Academic All-American of the 2002-03 school year, joining mens soccer player David Vassilaros. June 18: Scotty Wood Passes Away: Muhlenberg College lost one of the most beloved figures in its athletic history when Milton W. Scotty Wood passed away at the age of 89. In the 1940s, Wood began feeding Muhlenberg basketball players at his downtown establishment, the Home Restaurant. That led to the formation of Wood Dining Services, which today is the fourth-largest food service company in the United States. In 1984, Muhlenberg named its annual tipoff basketball tournament for Scotty Wood, and in 1999 its new AstroTurf facility was named Scotty Wood Stadium. In recognition of his support for the Muhlenberg athletic programs, Wood was inducted into the Athletic Hall of Fame in 2002. June 19: Football Team Ranked 17th in Preseason Poll: After going 10-2 and reaching the second round of the NCAA Tournament in 2002, the Muhlenberg football team is ranked 17th in Division III by Street & Smiths college football preview magazine. The preseason ranking is the second for the Mules in the last three years. In 2001, they were tabbed 16th by Lindys. Senior running back Matt Bernardo (right) was named to the S&S preseason All-America team. Last fall, Bernardo rushed for 1,393 yards and 17 touchdowns, caught 32 passes for 340 yards and four touchdowns and returned 14 kickoffs for an average of 31.4 yards with one touchdown. The other running back on the preseason All-America team is David McNeal of Kings Point, who ranked second in the nation in rushing last year and will go head-to-head against Bernardo in the season opener on Sept. 6. June 25: Baseball, Womens Lax Among National Leaders: The Muhlenberg baseball and womens lacrosse teams were among the best in Division III statistically in 2003, according to the recent NCAA release of statistical leaders. The baseball team was fourth with its average of 3.19 stolen bases per game. That is the highest ranking ever for the Mules in a team category; the 1976 team (seventh in fielding percentage) held the previous best. Muhlenberg also was 44th in doubles per game (2.17). Individually, seniors Justin Graf (sixth, 1.17) and Justin Rubenstein (35th, 0.61) both were in the top 40 for stolen bases per game. Senior Kevin Komeshok tied for 14th with six saves, and sophomore Gregg Burkhart was 26th with 10.3 strikeouts per nine innings. 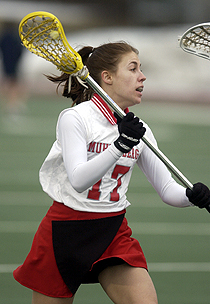 Freshman Courtney Tapkas had the highest ranking for the womens lacrossse team. She was fifth with her Centennial Conference-leading 4.87 goals per game and 12th at 5.60 points per game. Tapkas led all Division III freshmen in both categories. Senior Lynsey Caldwell (left) tied for 10th with 2.40 assists per game, and classmate Sarah Bowman was 19th in ground balls per game (5.13). In the team categories, the Mules were 18th in scoring (13.87 goals per game) and tied for 18th in caused turnovers (12.80 per game). According to LaxPower, Muhlenberg was the 14th most-improved team in Division III in 2003, increasing its power rating rank 21 places from 72nd to 51st.